2013 Monsoon in ending phases? ‘Withdrawing monsoon’ to give more rain to north! The Monsoon season of 2013 reached it’s peak in Pakistan in the month of August when it poured high intensity rains in the south and the central areas that were experiencing a dry rainy season though the north continued to experience above normal rains in June, July, August and even in September. Monsoon has withdrawn from most Pakistan! Monsoon leaving the sub-continent, Alas! The process of monsoon withdrawal started since last weeks of August in south and central parts and by the first week of September the monsoon withdrew from these parts. Northern areas of Pakistan are experiencing probably their’s second last monsoon spell that started on September 8. This year the monsoon withdrawal has been mostly normal as compared to past three years – 2010, 2011 and 2012. In all those three years, the monsoon extended till the middle of September with heavy downpour. 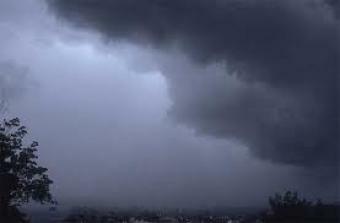 Indian Meteorological Department (IMD) might declare monsoon withdrawal from western India on September 9. The upper parts of Pakistan have been witnessing daily rain (isolated to scattered in nature) since the beginning of tenth spell on August 27 before that a short dry gap was witnessed. The rain coverage increased again on September 8 as thick clouds were observed on satellite image as the the 11th Monsoon spell (first mentioned in Monsoon of Pakistan on September 1) hit the Northern areas on September 8 (with +1 day error). The intensity remains moderate so far. North – More rain likely? 11th and 12th spell – Rain clouds seen in North. 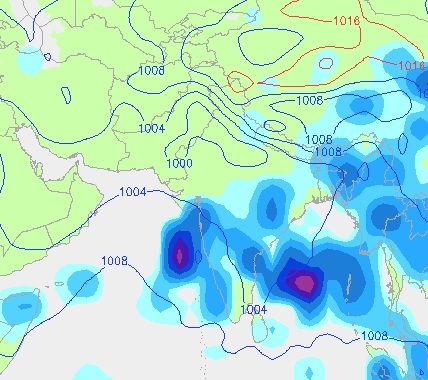 Notice: As compared to the previous spell, the 11th monsoon spell is weak in intensity however due to western low and continuous penetration of weak moisture from Arabian sea, some areas of north will have chances of rain in the coming week after that a decrease in moisture is seen. Due to the eleventh monsoons spell, showers/rain along with thunder/lightning can occur in Islamabad, northern Punjab (Lahore, Rawalpindi, Murree city, Jhelum, Gujrat, Sialkot, Norwal, Sheikpura, Gujranwala, Attock, Mandi Bahauddin and few adjoining districts), Khyber Pakhtunkhwa (Naran, Mansehra, Abbottabad, Peshawar, Haripur, Swabi, Battagram and few adjoining districts), FATA (Khyber Agency, Kurram Agency, Orakzai Agency and few adjoining areas) and Azad Kashmir (Muzaffarabad, Kotli, Mirpur, Rawalakot and few adjoining areas). The 11th spell can remain till September 9/September 10. Most rain bearing clouds can form/stay in Jammu and Kashmir. Mostly dry with passing clouds expected in Faisalabad, Okara, Pak pattan, Sahiwal, South Waziristan, Dera Ismail Khan and few adjoining areas during this period. Central Areas: Monsoon nowhere to be seen? Mostly dry weather expected with few passing clouds in south Punjab (Bahawalnagar, Bahawalpur, Multan, Dera Ghazi Khan and other adjoining areas). Dry weather expected with few passing clouds in many parts of Balochistan (Barkhan, Dera Bugti, Musa Khel, Zhob, Qila Saifullah, Loralai, and few adjoining districts). Mostly dry weather with passing clouds is expected in most parts of Sindh (Karachi, Thatta, Jamshoro, Dadu, Nawabshah, Larkana, Badin, Sanghar, Khairpur, Sukkur, Tharparkar, Mirpur Khar and other areas). Partly/mostly cloudy weather can be witnessed in coastal Sindh especially Karachi while eastern areas of Thatta, Badin and lower Tharparkar can witness low and mid-level clouds . Small weak cloud formation can take place on Panjgur, Kech and Awaran districts of Balochistan. Other areas of Balochistan will remain remain with few passing clouds (Kharan, Lasbella, Khuzadar and other adjoining areas). From the middle/late of this coming week, temperatures can increase in parts of the country by 2°C/3°C. There is a probability that once the coverage of the 11th spell dies down on September 9 night/September 10, a similar intensity spell can affect the northern areas on September 12 (+1,-1 day error). After the 12th spell, mostly dry weather is expected in the upper parts. Tropical Seasons begins as monsoon withdraws! The west coast of India can witness some rain as the eastern Arabian sea is set to become a hub of clouds from the coming late week. Weak clouds from coastal Gujarat can move into coastal and south-eastern Sindh. While there is a tropical depression formation alert during the third week of September as a numerical models points towards the formation of a depression near Maharashtra coast. All tropical activities in the Arabian sea are always monitored by PWP either it affects Pakistan or not! ← Pakistan Weather Portal (PWP) – August 2013 in Review! Today, the Dust Cloud is covering all of Pakistan and half of India, like you can see at http://www.ecoseeds.com/dust-9-8-13.gif and http://www.ecoseeds.com/clouds-9-8-13.gif so it is unlikely that there will be significant rain, until the Dust Cloud moves westward again. Unfortunately, looks like hot, dry and dusty for a while. Nice article.What will happen in Islamabad and khaur. Thanks, Islamabad has been mentioned. Chances of drizzle/isolated shower in Attock. Any chance of effecting Sindh by this tropical depression ? Not likely at this stage. when rain will begin in multan? Today, there might be good news about some more rain for the South in the next 10 days, from Hyderabad to Karachi, because the Dust Cloud has moved away from that area. is there chance of rain in Tharparkar and Umerkot district. Heavy and thundery showers in Lahore Defence area right now for past 15 minutes. There was some hail too for a couple of minutes but was scarce and stopped pretty quickly. 2 mm rain has been recorded by PMD. That was till 5pm most rain occurred after 5. Maybe it was an isolated event because we had flooded roads in phase5 dont know about rest of lahore. Yes I got to know that rain was isolated. 51 mm recorded at Airport. 19 mm rain has been recorded in Mithi on 12 Sept, evening. but at our station, it is 19 mm. there is hardly 1km distance between Met Office and our stataion. Is there chances of showers in hyderabad? DUST CLOUD WARNING. The Dust Cloud has moved away from the northern part of Pakistan today, and some moisture is moving in India towards that direction, and may form a pocket over Pakistan to produce substantial rains. 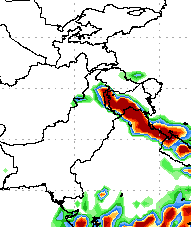 Also, within a week a large amount of moisture might make its way from Indonesia towards India and Pakistan. chances of rain in hyd ? Hot temperatures, Late this week there are chances of showers/rain with windy conditions.